Oh yeah. I'm definetly enjoying it! One other decent Martin Shaw series was Apparitions. It was a supernatural thriller series first shown in 2008 about a priest who battled Satan. Nope. Doesn't ring any bells for me. Gordon Jackson has a fine role in one of my all time favorite movies, The Great Escape. I'm working my way through that right now. I appreciate him very much in this series. Fine acting, and also the rest is well done. I was sceptical about it, because I thought the topic wouldn't interest me at all. It was a pleasant surprise to be so wrong. George Gently is next on my list. The Chief was interesting, but nothing I will rewatch soon. The Scarlet Pimpernel is one I would like to see, if only for the parts including him. I have seen only a few scenes, and he's really good when he's bad. No idea about the rest, though. Guess it's not my cup of tea. There are a few more films I'd like to get my hands on, but unfortunately not everything is available, especially not the older ones. And nothing is ever aired here. *grumble* The only film I remember was The Hound of the Baskervilles, back in the 80s. And no matter how different the roles, sometimes I catch a moment where I say "Ah, there's Doyle." A look, a gesture, a tilt of the head, the way he says something. I can understand, when Martin Shaw is annoyed with always being connected to this single character, when he has done so much other work, both films and theatre. But how can he know what The Professionals and the characters mean to some of us? The Great Escape: Wonderful cast, one of my favorite films. Still need to watch it in English, though. Gawd, so many films, so little time. At first, I thought Martin was a bit too reserved as Father Jacob but got better as the episodes went along and there were quite a few hair-raising moments. I think "reserved" works quite well with a priest. And the quiet, confident way suits the character well. It sets the right mood. Martin achieves so much in this with his fine acting. The opening credits (titel credits? the part with the music theme and the names - you know what I mean, and I'd definitely appreciate it, if you could help me out with my insufficient knowledge of the English language) are great. The music and the pictures are quiet, but very powerful. And I enjoy the humour. There's a lot, subtle and quiet, fitting perfectly into the series. "Hair-raising moments"? Oh yes! Yesterday I watched the 5th episode and it left me longing for the last one today. I'm looking forward to seeing how this one works out. Apparitions was a great series, shocking it never got a second run. Another cracking bit of TV Martin did, was back around 91, it was a three parter called 'For The Greater Good'. I don't think it has ever been shown again. Being in the US I first saw Martin Shaw in The Hound of the Baskervilles. I don't remember much about him in it but I did enjoy Ian Richardson portrayal of Sherlock Holmes. Lewis Collins I first saw in The Final Option. 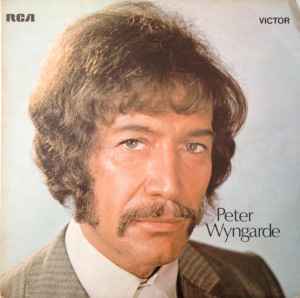 The US title for Who Dares Wins. Gordon Jackson was a familiar face from repeated viewings of The Great Escape as well as his other numerous film and tv appearances. That version of 'The Hound of the Baskervilles' is coming out on BD in the UK on April 25th. 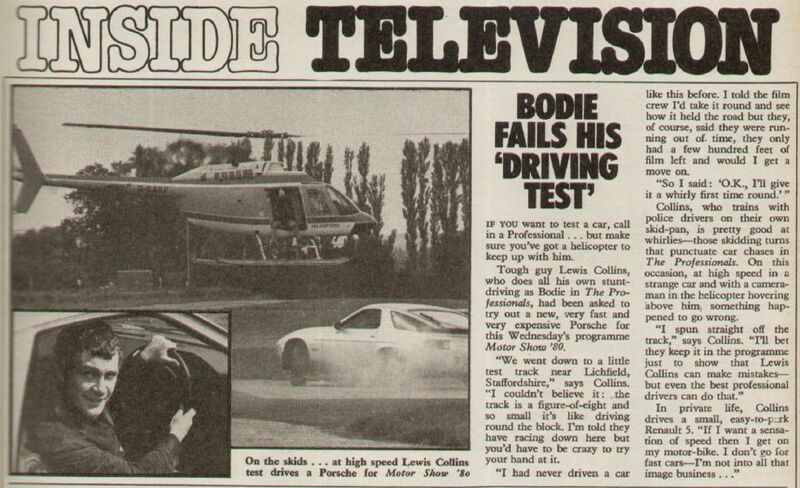 Lewis Collins appeared in Motor Show '80, shown on Wednesday October 15th 1980 at 10:30 PM on ITV. 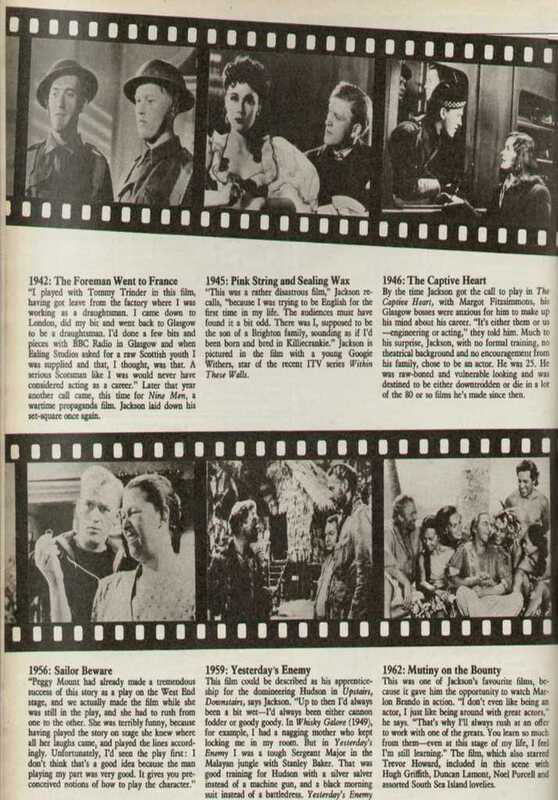 All this stuff from the TV TIMES of that week. This is revealing. What a genuine guy Gordon was. Just listened to Martin Shaw and Christopher Timothy on Graham Norton's BBC Radio 2 show. They were talking about a play they're doing in London 'Hobson's Choice'. Interesting. Shaw has apparently grown a great big bushy beard. Surprised he didn't talk about the pinnacle of his career - pushing the start button on the National Lottery machine a couple of weeks ago. He may have done. I tuned in mid-conversation. Much as I love the Network DVD's, I would have liked them to have included previous work of Gordon, Martin and Lewis as extras, like The Sweeney DVD's did with Redcap, Special Branch, etc. The New Avengers Obsession episode would have been especially welcome! Especially if it was digitally restored in HD. They could have included an episode of Villains which starred Martin Shaw as a career criminal as well as an ep of Crown Court where Lewis played a policeman. What do my fellow members think of Martin Shaw as Scott in The Last Place on Earth. I've never seen it but it seems like something I'd be interested in. 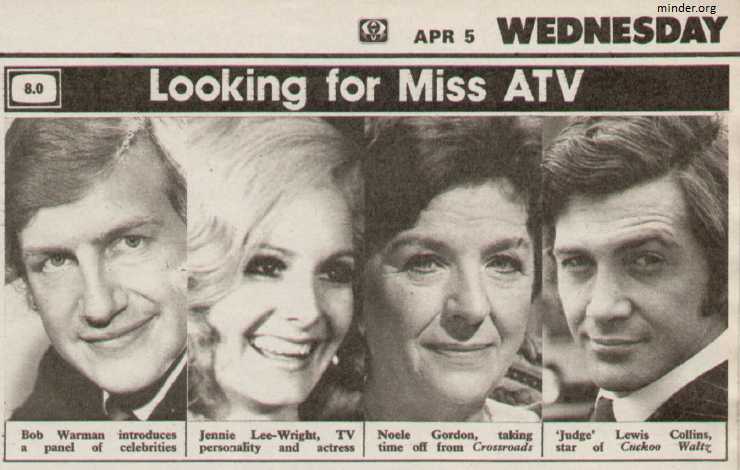 Lewis Collins, star of The Cuckoo Waltz - judge of Miss ATV, April 5th 1978. Martin Shaw in Cream In My Coffee (1980). An elderly couple take a holiday in The Grand Hotel, Eastbourne, where as young adults, much in love they once went on holiday. When they arrive at the hotel though many things have changed, including the couple's love for one another, which has become soured with years of togetherness and bitter familiarity. A Dennis Potter scripted TV movie from 1980, this is a well written, funny, engaging story tinged with a degree of sadness, about the drawbacks of age, monogomous relationships, and nostalgic memory. Lionel Jeffries plays Bernard Wilsher, a cantankerous old b*****d who seemingly suffers from both heart problems and some form of dementia. Whereas his long suffering (or is she?) wife, Jean, is played by Peggy Ashcroft. Both are perfect in their roles. Excellent. Martin Shaw, playing Jack Butcher, it has to be said looks the part of a caddish, 1930s crooner to a tea. But his accent is up and down more than Jean's nightie and as a result he's probably the weakest link in this. Overall it's an excellent drama, and one well worth seeking out. Martin Shaw appeared in this episode of Z cars (28/6/1977) a few months before The Professionals. To be honest, I thought it a bit of a snooze fest. Johnny Briggs and Frederick Treves also appear. Also, Martin is to appear in a new film called 6 Days, which is about the 1980 Iranian embassy siege and a big inspiration for Who Dares Wins! 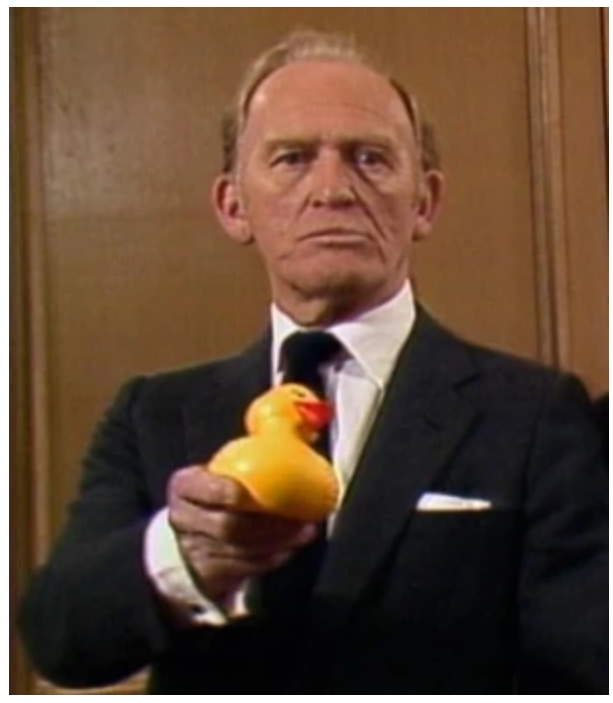 We've just bought a Sesame Street DVD for my grand-daughter and who should pop up partway through one of Ernie's songs but Gordon Jackson (one of many filmed celebrity inserts) deadpanning a couple of lines!! What the flip? How did he end up on there? 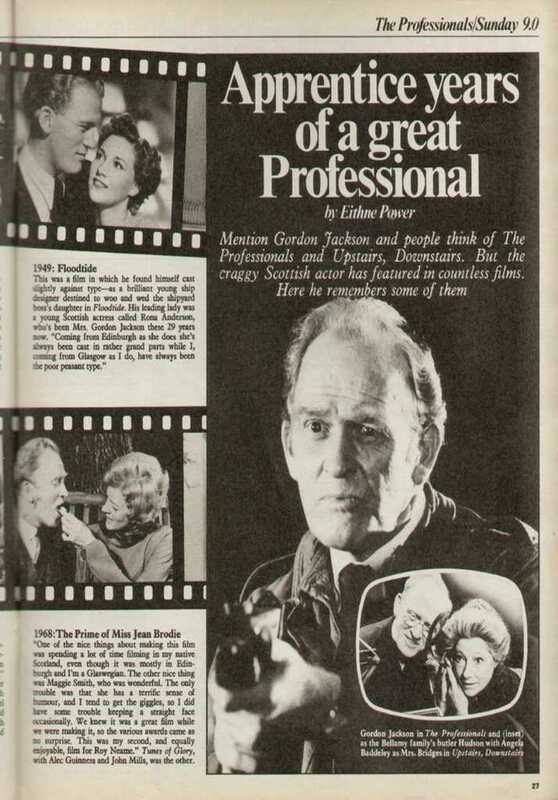 Was the clip of Gordon Jackson from Upstairs Downstairs? Ernie's song may have been produced back when PBS was running Upstairs Downstairs in the 1970s.